Distinctive textures add eye-catching appeal to this cool, confident multi-function men's watch. 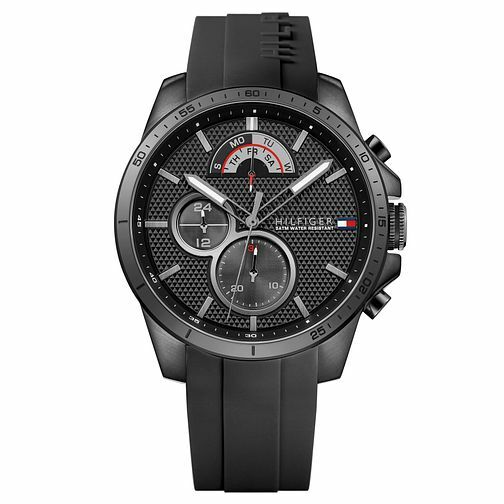 Featuring a protected crown with etched flag detail, and sport bezel, the 46mm dramatic black ion-plated stainless steel case is presented on a black silicone strap with embossed HILFIGER and printed white flag logos. Highlighted by a black/grey retrograde-look day indicator at 12-o-clock, the pique-textured black dial also sports two round sunray sub-eyes, a small 24-hour hand at 9, and a date hand at 6 and signature red/white/blue accents.